Immunohistochemistry (IHC) is one of the fast growing technologies for elucidating the diagnosis & prognosis of various cancers. Immunohistochemistry (IHC) refers to the process of detecting antigens like proteins in cells of a tissue section taken during biopsy. Identifying and scoring cancer markers plays a key role in oncology to characterize the tumor, determining the aggressiveness, predicting patient outcome for many cancer types and finalizing the treatment procedure. 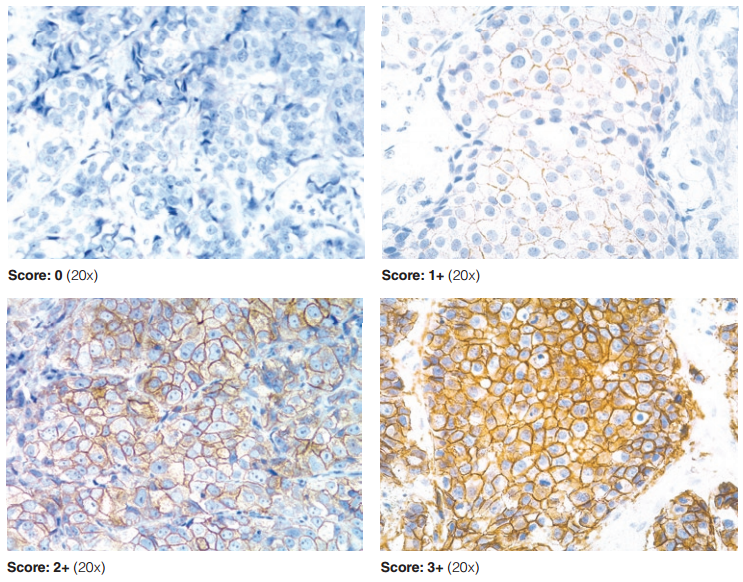 IHC staining of biopsy samples with antibodies to specific molecular markers is a major component in this process. It uses a scoring system (+1, +2, +3) which will help the pathologist to diagnose the cancer as well as aid the doctor to finalize the therapy. IHC is used in many cancer type detection like Breast, Prostrate, Lung, Ovarian, Liver, Pancreatic, Leukemia etc. A cancer biomarker refers to a substance or process that is indicative of the presence of cancer in the body. A biomarker may be a molecule secreted by a tumor or a specific response of the body to the presence of a specific cancer. Most Bio markers (tumor markers) are found to be proteins and some patterns of gene expression and DNA changes are also considered to be tumor markers. More than 20 tumor markers have been developed for clinical use. One kind of cancer is normally featured with one or more tumor markers. IHC Test menu for clinical diagnosis will increase when more bio-markers are discovered in the future. Here are few sample Biomarkers for better understanding. Pharmacodynamics and pharmacokinetics: To determine the most effective treatment for the identified cancer. Recurrence: Predicting or monitoring cancer recurrence. A lab receives a specimen from a biopsy and prepares a block from which an H&E (Haematoxylin and Eosin) slide is prepared. 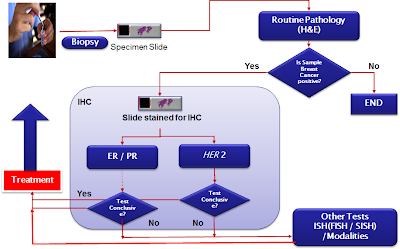 The typical IHC workflow starts with the diagnosis of cancer by a pathologist reviewing the H&E slide. After initial diagnosis, pathologist orders an IHC panel. An IHC panel consists of consecutively cut slides from the same specimen block that are then stained with different IHC stains. A typical IHC panel for breast cancer includes three IHC stains say, HER2 (Human Epidermal growth factor Receptor 2), ER (Estrogen Receptor) and PR (Progesterone Receptor). 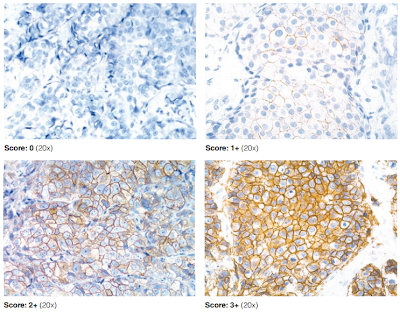 The pathologist then provides a semi-quantitative assessment of the IHC slides to determine the appropriate treatment option. 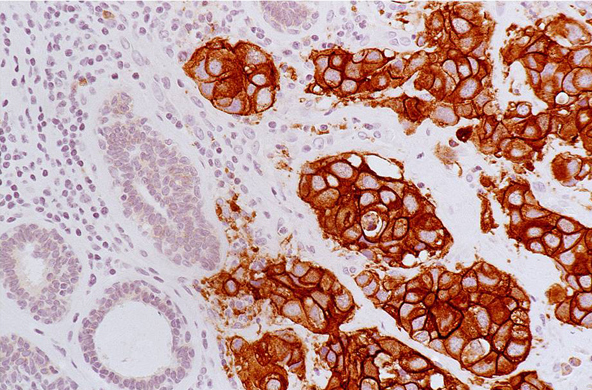 HER2 is a membrane stain from which the pathologist assesses the intensity and completeness of the membrane staining of the tumor cells and determines a score of 0, 1+, 2+ or 3+ for the slide. HER2 is used specifically to determine the aggressiveness of breast tumors and to assess Herceptin® (Trastuzumab) as a treatment option. ER and PR are nuclear stains from which the pathologist assesses the staining intensity of the nuclei of the tumor cells and determines the percentage of positive stained nuclei as a percentage between 0 to 100% and the average staining intensity of the positive nuclei as a score of 0, 1+, 2+ or 3+. NB: If the IHC HER2 test results are negative or borderline, patient may ask her doctor about getting the FISH(Fluorescence in situ hybridization) test, which uses different technology to measure HER2 status. If the FISH test results are borderline, she might want to ask the doctor if more than one pathologist reviewed the results. If the HER2 test results weren't reviewed by more than one pathologist, patient may ask if the results can be reviewed again to make sure the correct diagnosis/prognosis. FISH is considered more accurate. In many cases, a lab will do the IHC test first, ordering FISH only if the IHC results don’t clearly show whether the cells are HER2-positive or negative. 1. Visual observation by a health care professional : this the conventional method by which Pathologist is looking a the specimen using a microscope and performing the diagnosis. 2. Colorimetric pattern recognition (Microscopic examination of prepared cells by size, shape, hue, and intensity as observed by an automated computer controlled microscope and image processing tools. A combination of Whole Slide Imaging (WSI) digital microscope and approved IHC scoring image analysis tools enables this process. The specimen slide will be scanned by a digital microscope and generate digital image for diagnosing. high zoom digital cameras are using for scanning the slide. 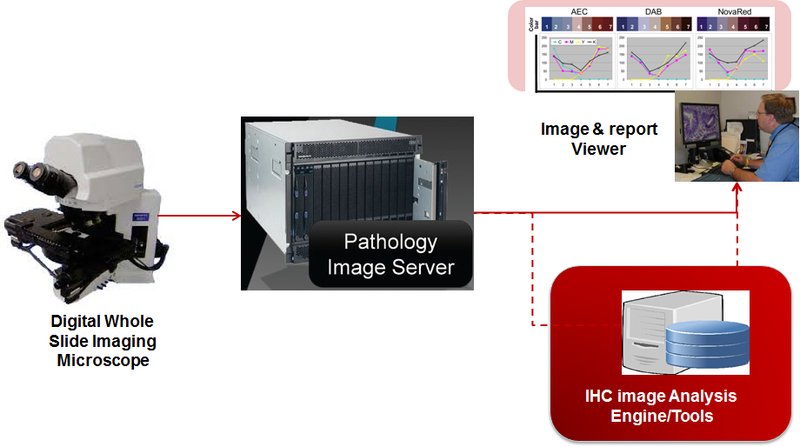 The camera will take picture of the required ROI as decided by the pathologist or it takes picture of the entire slide. the number scanned images will be depends on the zoom selected. the typical zooming options are 10X, 20X, 40X, 80X etc. Finally the scanned images are stitched by imaging processing tools and create the complete whole slide image. 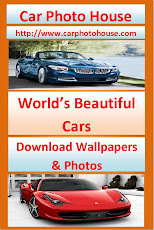 the images will be typically stored as JPEG files in the image repository. The Pathologist will access the image using image viewer software are diagnosing the cancers. The image viewer will support typical image processing and editing tools to make the process more convenient. Once the manual diagnosis is completed, image along with the diagnosis results will be stored back to the laboratory information system(LIS). 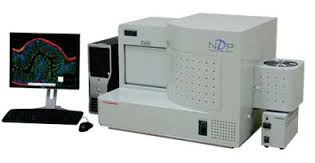 The digital microscope is supported by slide loaders, bar code readers, lenses, digital camera, slide loader and powerful computer. Olympus, Dako, Aprio, Ventana, Hamamatsu etc are market leaders in WSI microscopy. The pathologist has to select the Region of Interest(ROI) during the using the proper image editing viewer software. Pathologist can select multiple ROIs in a single slide. Based on the primary investigation inputs, perform the cell classification and then decide on the specific analysis based on the analysis. Pathologist can select single/multiple algorithms depends on the bio marker to be counted say analysis for Her2, EP, PR etc. The selected image and corresponding settings shall be will be stored in the image storage/LMS. 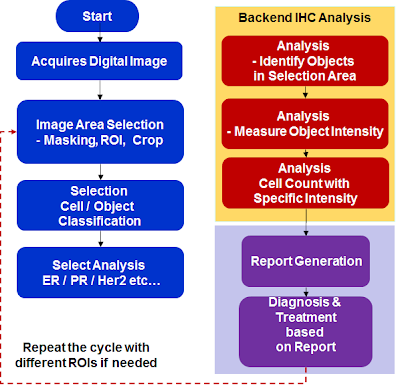 Regulatory compliance and approval are required for the digital image acquisition techniques, IHC stains( e.g. HER2, ER, PR, Ki-67, P53, EGFR), reagents(e.g. Dako, Ventana, image analysis software etc. Specific approvals are required for research, diagnosis, prognosis etc. the approvals are required for target country requirements. 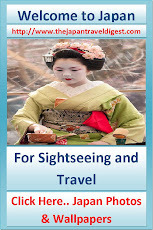 For example, approvals are required from Food and Drug Administration(FDA) for US, approvals from Ministry of Health, Labour and welfare(MHLW) for Japan etc. Net Promoter® Score (NPS) - How to Measure Customer Loyalty? Why Windows 8 Losing Momentum in the Market? Here is the Adoption Barriers. © Theprofessionaldigest. Simple theme. Powered by Blogger.